In March when I visited Boston University's Gotlieb Center, they had on display a 2008 letter from Kirk Douglas to his son Michael Douglas. It included a funny hand drawn portrait in profile of Kirk and his trademark cleft chin. I thought to myself, wouldn't it be nice to read some more letters written by Hollywood movie stars? Fast forward a month later when I attended the TCM Classic Film Festival. Lo and behold in my goodie bag was a copy of TCM and Running Press' new book Kirk and Anne: Letters of Love Laughter, and a Lifetime in Hollywood. What an unexpected treat! 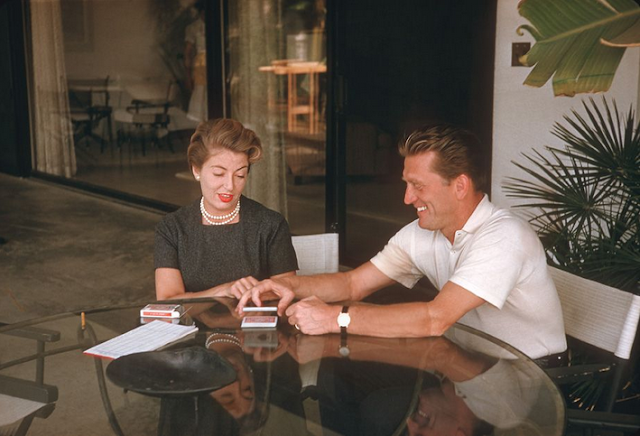 Kirk Douglas is one of my very favorite actors and this was a wonderful opportunity to read some of his letters and to learn about his 60+ year marriage to his wife Anne Buydens Douglas. Kirk Douglas met Anne Buydens in Paris 1953. They fell in love and married in Las Vegas the following year. It sounds like the makings of a whirlwind romance but it was anything but that. Anne heard that Kirk Douglas needed a translator while he was in Europe. She met with him and turned down the job. This drove Kirk a little batty. The divorced Kirk had a busy dating life and was serious with actress Pier Angeli when he met Anne. Although he was immediately smitten with Anne and she with him, he made it clear early on that he planned on marrying Pier. Oh how different dating was back then! Anne couldn’t stand being the other woman and she broke up with Kirk which drove him right into her arms. They soon married and are still married today more than 60 years later. The book is written from both Kirk and Anne’s perspectives. Readers learn the story of young Issur Danielovitch, a young Jewish man growing up in abject poverty in Amsterdam, NY. He grew up with a doting mother, 6 sisters, a disinterested father and a passion for acting. Then there’s the story of Hannelore Marx born and raised in Germany. During WWII she fled the Nazis and reemerged as Anne Buydens. Kirk Douglas became a world-famous actor and Anne became a movie industry executive helping Hollywood actors with translation and organizing the Cannes Film Festivals. We learn about their family lives, careers, how they met and the journey they had with all it’s ups and downs including Anne’s breast cancer, Kirk’s stroke, manager Sam Norton’s extortion of their finances and the death of their son Eric. Within the pages of this book are countless letters between Kirk and Anne. They are sickeningly romantic and will make you doubt how much you really love your significant other. Kirk and Anne have a special relationship that can be described using the contemporary phrase “relationship goals.” Also included are letters from famous friends. We learn about their Hollywood lifestyle and their friendships with Elizabeth Taylor, Michael Todd, Frank Sinatra, Tony Curtis, Janet Leigh Merle Oberon, Edward G. Robinson, Barbara Stanwyck, William Haines, and many more. Kirk Douglas was a goodwill ambassador for the government. Kirk and Anne developed a social circle of political heavyweights included presidents like JFK, Lyndon Johnson, Gerald R. Ford and Ronald Reagan and Secretary of State Henry Kissinger. Anne is an a-plus socialite and in many cases their friends were more dazzled by her than her movie star husband. I loved learning about Kirk and Anne Douglas’ charitable efforts. First there is the Anne Douglas Center, a rehab for homeless women. Then there is the Anne and Kirk Douglas Playground Award. Los Angeles schools have benefited from this program. The Motion Picture and Television Fund’s Country Home has an Alzheimer’s unit and their MPTF Home has a Kirk Douglas Care Pavillion thanks to the Douglas’ donations. There is even a Kirk Douglas scholarship at his alma mater St. Lawrence University. For those of you who are particularly interested in Kirk Douglas' film career, myself included, there is plenty of behind-the-scenes information about the making of Lust for Life (1956), The Indian Fighter (1955), Paths of Glory (1957), Spartacus (1960), Seven Days in May (1964) (JFK encourage him to make the movie! ), and more. Neither Kirk nor Anne are afraid to gossip so there is quite a bit of dish about their movie star friends and colleagues. Kirk and Anne is a beautiful book filled with heartwarming letters and fascinating stories. It's a unique insight into the marriage and lifestyle of a Hollywood couple. I thoroughly enjoyed reading it and now want to dive into more books about Kirk Douglas; he’s written several. I encourage you to pick up this book. It’s a quick read and will be a nice addition to your home library. 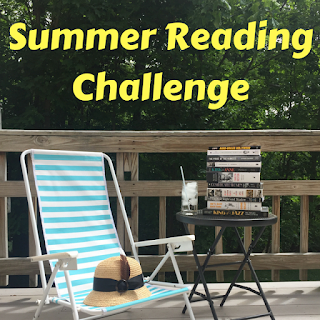 This is my third book review for my Summer Reading Challenge.